It wasn’t the most fortunate of circumstances that led to this move. But it’s not uncommon for that to be the type of situation that leads to change so here I am. It’s Christmas morning and I am preparing to leave the US and cross the border into Nuevo Laredo, Mexico. I left my home in Kansas on December 23rd after having sold all of my furniture and most of my belongings except for what I could pack into and on top of the 1998 Nissan Pathfinder that I purchased for the trip. I probably tried to hang on to too much but that’s just my nature. 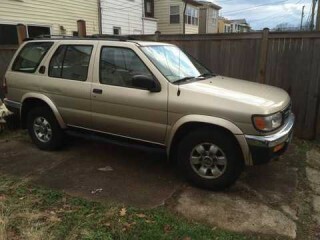 1998 Nissan Pathfinder I bought from a Russian mechanic in Kansas City for the trip. The drive from my home in Kansas to here at the border was almost exactly 1000 miles. I seem to be getting about 16 miles to the gallon which is better that I expected given the load I’m carrying. That puts my gas cost at about 17 cents a mile. The turmoil and violence in northern Mexico prompted me to carefully plan my upcoming border crossing. I owed it to my family not to get myself killed on my first day in Mexico so I decided to cross at Laredo, into Nuevo Laredo, Mexico which seems less risky than crossing into Juarez. Then I came up with the added plan to cross at the crack of dawn on Christmas morning as probably the safest time to make a dash from the border to somewhere south of Monterrey. Just before arriving in Laredo I had stopped in the little Texas town of Devine to try to get some wiring done so that I could hook up my 120 volt power inverter. I found exactly what I was looking for in a little independent roadside garage where I got the most gracious service imaginable. The shop owner, Adulio, helped me find a location where I could run the wires through the firewall to connect to the battery. He also cautioned me about traveling through northern Mexico and advised me to stay on the main road at least until I get past Monterrey. Reading the current status reports on the US State Department’s website I see that Monterrey is “hot” just as Adulio described it. I spent my last night in the US at the Red Roof Inn in Laredo, Texas, about 3 miles from the border. I’m nervous about all the violence around the northern Mexico border towns so I opted to grab an early dinner at a familiar place – Chili’s – so I could be back in my hotel room before dark. I got to bed early as I had only slept sporadically in the car during the drive down from Kansas. I was woken up around 10:30 pm by the sounds of what sounded like a fiesta going on across the street; punctuating the fact that life as I knew it in Kansas, was about to change. I woke up again about 3:30 am and the fiesta was still going strong – finally shutting down around 4 am. Before I went to bed I had realized that the GPS that I bought for the trip only came with US maps. I had planned to follow the Pan American highway route as much as possible but I still needed maps so I searched online in hopes of finding somewhere that I could download them for free but had no such luck. So, the first thing I did while the fiesta was wrapping up was to cough up the $50 to download those much needed Mexico roadmaps. That was the beginning of what would turn out to be an expensive day. I’m not sure where I am headed yet. Initially, I thought about Margarita Island, Venezuela. Margarita Island has a well-established ex-pat community but after making contact with a fellow in Florida who had recently moved back from there, I decided Venezuela was too unstable to gamble on. So at this point, I’ve decided to head to either Costa Rica or Panama, pause there and see what develops.